The blogging and traditional media contingent of the International Wine Tourism Conference 2012 had a chance to visit Arnaldo Caprai, a winery known for being pioneers in the revival of an indigenous grape, Sagrantino. And it is here, in Montefalco where the dark, tannic grape Sagrantino reaches its greatest potential. We were led by Marco, son of the founder Arnaldo, on a walk around the property. The family’s dedication to innovation was evident in the experimental vineyards, where vines varied in height, training system, rootstock, and density. The aim was to continuously improve quality by discovering the best viticultural practices for the grapes and the land. And, lest we thought we could just sit back and drink wine, Arnaldo Caprai Chef Salvatore Denaro put us to work as soon as we left the vines. 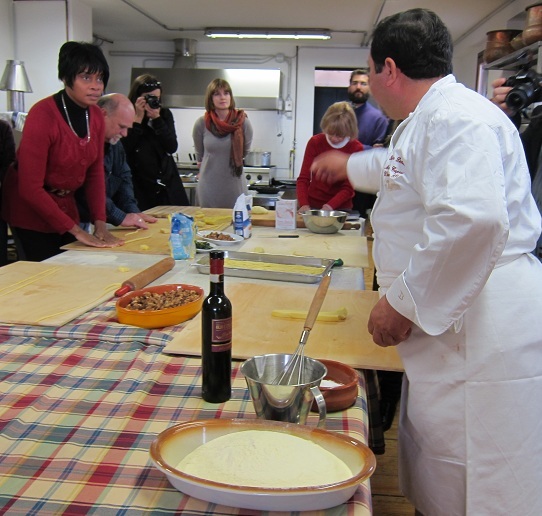 With boisterous energy, he sliced thumb-sized pieces of dough and bade us to roll, roll, roll the pasta. Although he spoke Italian, his message was clear: if we wanted to eat, we must work. We laughed at our efforts, where some of our noodles were too fat and some too thin. In the end, the Umbricelli pasta was delicious. 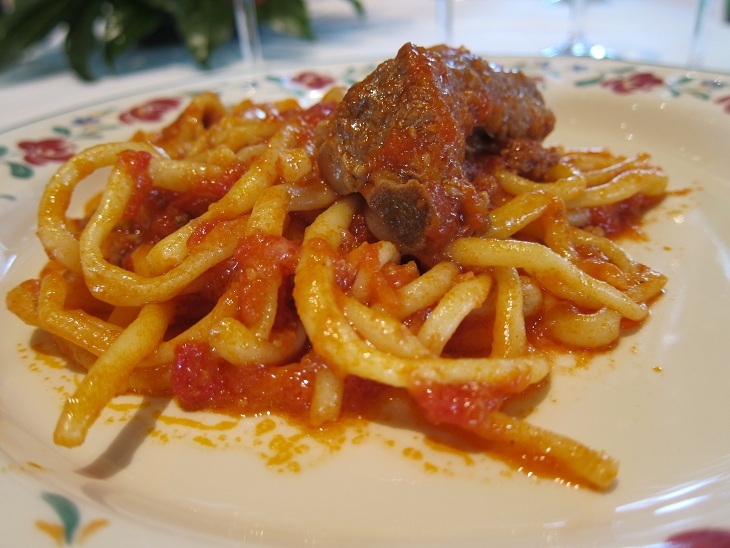 It was served with Chef Salvatore’s hearty ragu, a tomato sauce with ground pork, and topped with tender pork ribs. The selected Arnaldo Caprai wines served with lunch were good matches with the local cuisine. A starter of traditional antipasto, including wedges of Casciotta cheese, a delicious blend of sheep’s and cow’s milk, as well as locally produced prosciutto was tasty with the white wine, Grecante, a 100% Grechetto wine with high acid, lemon, minerality and a bitter almond finish. Moving on to reds, we first tried the Rosso di Montefalco, blended from Sangiovese, Sangrantino, and Merlot. It was medium-bodied and had a nice cherry character from its predominance of Sangiovese. Moving on to Sagrantinos, we first tried a Collepiano 2007, a dense wine with rich black fruit, and then on to the 25 Anni, which was first produced in 1993 to celebrate the 25th anniversary of the winery. This was a big wine with tons of character and structure that will age very well. In fact the aging potential of Sagrantino is decades. At a tasting in New York, I had been to a vertical tasting of Arnaldo Caprai wines going back to 1990s: these beauties, so brash in their youth, develop very interesting and complex character in their age, like many people I know.